Novel mutations in rice genes involved in silicon (Si) and arsenic (As) transport (Lsi1, Lsi2) and vacuolar sequestration of As (OsABCC1) were identified using reverse genetics. TILLING by sequencing of a population of chemically-induced mutants (n = 2048) detected 61 putative mutations. Following removal of mutations predicted to be synonymous or residing in introns, Sanger sequencing confirmed 21 of 23 nonsynonymous mutations and 13 M3 lines harboring homozygous mutant alleles (three lsi1, nine lsi2, and one Osabcc1) were identified for phenotyping. Altered sensitivity to germanium (Ge), a phytotoxic analog of Si, was observed in three lines. NM-E1746 and NM-3403 (both lsi1) had increased tolerance whereas NM-3036 (lsi2) was more sensitive, however, this appears unrelated to the mutation. Analysis of the straw from field grown plants revealed that NM-E1746 and NM-3403 were the only lines with significant reductions in total Si. Both mutants also had significant increases in total As and NM-3403 exhibited higher grain total As. The third lsi1 mutant (NM-3380) and two lsi2 mutants (NM-2902 and NM-2249) had increased straw total As. Increased grain total As was observed in NM-2902, NM-2249, and a third lsi2 mutant NM-E2244. Interestingly, NM-4903 (Osabcc1) had the highest total Si and was also the only line to have significantly less straw and grain total As. These novel mutant alleles represent useful genetic resources for further dissection of Si, As, and Ge transport in rice and the corresponding germplasm has potential for enhancing rice productivity and quality. The online version of this article ( https://doi.org/10.1007/s10681-019-2393-6) contains supplementary material, which is available to authorized users. This work was supported by Unites States Department of Agriculture, Agricultural Research Service CRIS Project 2032-21000-021-00D and the California Rice Research Board RB-3 Project (2015–2018) to T.H.T. 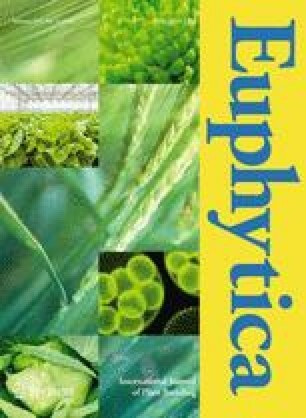 The authors thank Sarah C. Magee for technical support for phenotyping. Mention of trade names or commercial products in this publication is solely for the purpose of providing specific information and does not imply recommendation or endorsement by the U.S. Department of Agriculture. USDA is an equal opportunity provider and employer.